» Health Blog » Uncategorized » Morning Rituals We Are Committing to This Year! Morning Rituals We Are Committing to This Year! While there may not be one morning routine that works for everyone, there are a number of rituals and practices that, more often than not, set up a successful and happy day for anyone who gives them a try! Building mindful and healthy habits into your daily morning routine will help you thrive throughout your day, naturally increasing your potential! Your morning should be about you and your family. Serve yourself first before serving those sitting in your email inbox and before giving your time to social media. If you want to reach your full potential make it a goal to not check your emails or social platforms for at least the first hour of the day. Starting your day on your phone will rewire your brain for distraction throughout your day. If phone usage is something you want to cut down on, not just in the mornings, read our article here to help you kick your smartphone habits. 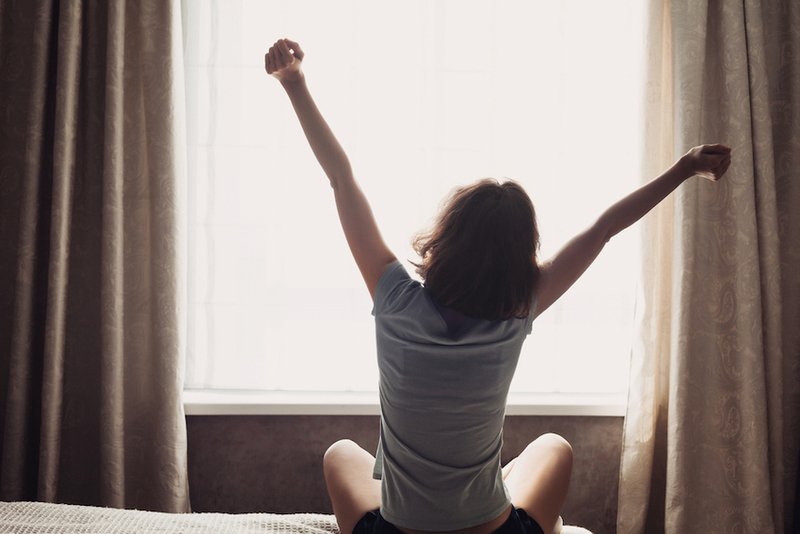 Think you don’t have time for morning rituals? Ditch checking your phone and you’ll have time free for the next 5 rituals! Deep breathing has been shown to relieve stress, relax muscles, improve immune function, lower blood pressure, and improve detoxification. We know this, yet most of us don’t think twice about this free health hack we should be doing daily. If you have 5 to 10 minutes in your morning, you can try one of our breathwork exercises. Don’t have 10 minutes? Take 10 deep breaths when you first wake up and step out of bed, while you make your breakfast, or at the traffic lights on the way to work, your options are endless. Most of us are spending the majority of our day sitting still at work desks, wreaking long-term havoc on our health. Use the morning to move your body before you commit to your desk chair. There is so much to gain from moving your body for at least 20 minutes a day. Exercising doesn’t have to mean getting all geared up to hit the gym or a HIIT class. Just including more walking and stretching into your day can assist in undoing the effects of sitting all day. This might be the best, NEW thing you can add to your morning routine. TRANSCENDENCE taught us how much we can benefit from cold exposure. While we may not be able to have daily ice baths like the master, Wim Hof, we most definitely can switch the shower to cold for the last couple of minutes of our shower. The cold exposure can help to reset the nervous system and lowers inflammation in the body. And it will definitely wake you up!! This can be done at any time throughout the day, but try kicking your day off with it, allowing gratitude to be what defines your day. You are only human if you begin to think about your long list of ‘to-do’s’ and feel a little bit of angst and resentment for the things on that list, but science has shown us again how powerful the mind can be. Start making it a habit to think of 3 things you are grateful for each day before you tackle the to-do lists! At first you might find this tricky but with a little bit of practice, you’ll be feeling the health benefits in no-time. Set your brain and body right from first thing in the morning. This amazing vessel that we get to live in is made up of 70% water, so before you eat anything or reach for the coffee, you need to drink at least 1 glass of water to help hydrate your brain and the rest of your body. This will help reduce fatigue, brain fog, muscle cramps, constipation, and more! Then it’s time to nourish your brain (your control center) and the rest of your body with some of our favorite functional foods.